For 32 students. Easy-to-use Gram stain kit allows you to view Gram-positive bacteria (blue) versus Gram-negative bacteria (pink) for bacteriological identification. Kit provides bacterial cultures that represent all 3 bacterial morphologies (rods, spheres, spirals). Students can use classification to identify bacteria. Requires oil immersion lens. Includes detailed instructions. For 32 students in 8 groups. Bacteria stain differently because they vary in cell-wall composition. This easy-to-use Gram stain kit allows you to view Gram-positive bacteria (blue) versus Gram-negative bacteria (pink) for bacteriological identification. Kit is designed with bacterial cultures that represent all 3 bacterial morphologies (rods, spheres, and spirals) so students can use classification to identify the bacteria. Requires the use of a microscope with an oil immersion lens (not included). Activity takes 45 min to complete. 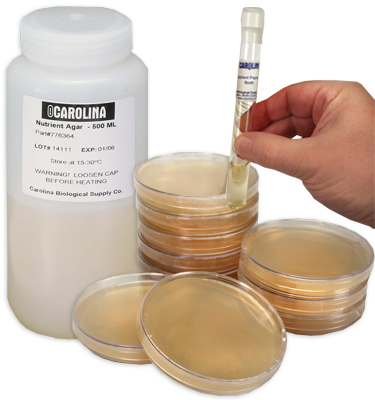 Kit includes detailed instructions and bacterial cultures.